Raymond is the first student to be a part of the school’s new St. Andre Program, which is designed to support students with intellectual disabilities in an inclusive setting. The new program, which complements the school’s already existing St. Joseph Program for students with high-incidence disabilities, has been in the works for years as the school has been researching how to develop it. “We had a real crisis of faith when four said ‘no,'” she explained, adding that sending him to a Catholic school “is especially deep in our hearts” because Raymond was adopted through Catholic social services. After Tetschner and Greer met, Raymond applied to the school and was accepted, and the family moved to be closer to Bishop McNamara. “We were ready to say ‘yes’ and they were ready to say ‘yes’ to us,” Greer told the Catholic Standard, the archdiocesan newspaper. 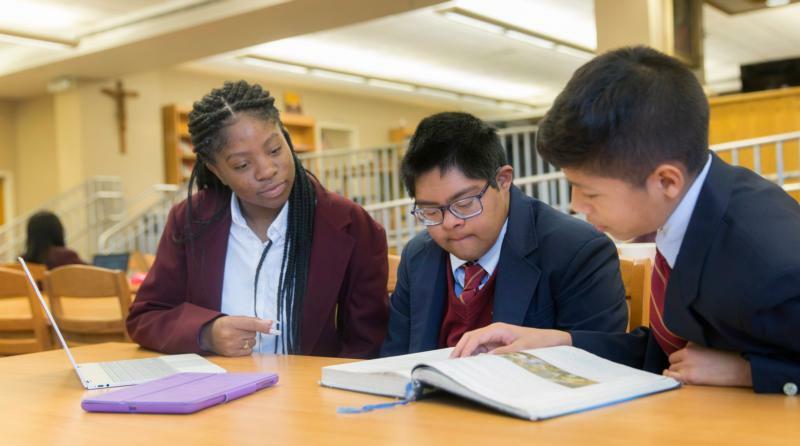 To fund the new program, Bishop McNamara High School received a grant from the Catholic Coalition of Special Education, which has awarded nearly 60 grants to 30 Catholic schools in eight Maryland counties totaling more than $1 million since 2004. The program also received funding from Tribute 21, a component fund of the Community Foundation for the National Capital Region, dedicated to raising awareness and raising funds to support those with Down syndrome. Since Holy Cross, an all-girls school, had the only inclusion program of this type in the Archdiocese of Washington, there had been no high-school level inclusion program in the archdiocese for boys with intellectual disabilities before this year. Raymond and his parents work with his teachers to develop his schedule, which includes a mixture of college preparatory classes, electives and one-on-one instruction with the coordinator of the St. Andre Program. Raymond said his favorite class is theology because he likes to talk about God. Michelle Tetschner said if her son attended a public school, he would have been segregated from the rest of his peers, while at Bishop McNamara he is in the same classroom as the other students for most subjects. “Being fully included not only helps Raymond. It helps other kids as well,” she said, making them less fearful of interacting with people who have disabilities. Outside the classroom, Raymond participates in school life too. He is a manager of the football team, has a role in the school play and is a choir member. He said the future of the program is “whatever God has in store for us,” but added that he knows there is a large community of people who are looking for a Catholic school for children with disabilities. “We will continue to grow; we will continue to keep our doors open to more students, because we know it is the right thing to do,” said Clark, adding that he was grateful to the Tetschner family for believing in Bishop McNamara High School.